I have written about birria often (e.g. 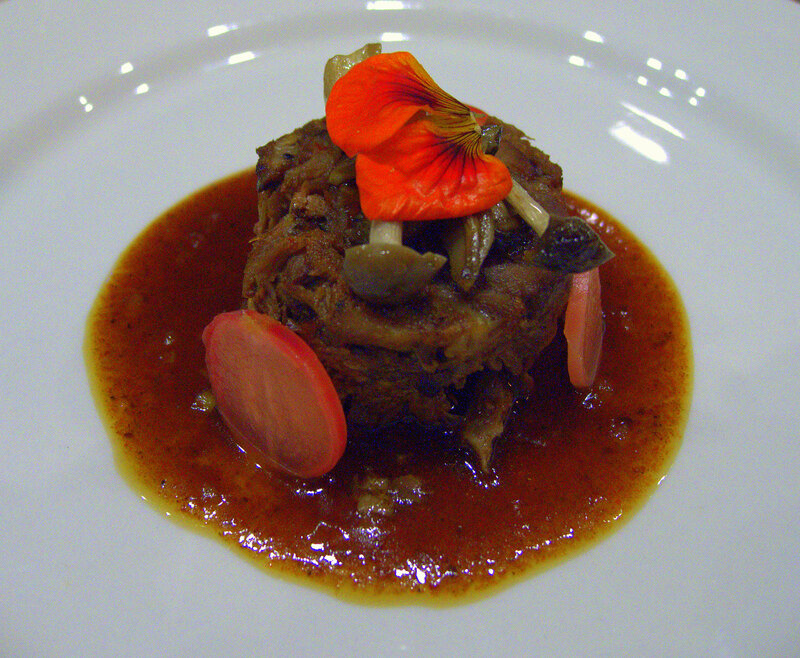 http://sdfoodtravel.com/badass-kosher-jewish-mexico-its-not-an-oxymoron/). There is no single classic Mexican dish that has more captured my imagination. It is a dish that is nearly ubiquitous at roadside stands and restaurants throughout the north and west of Mexico. Birria is meat braised slowly in a rich broth spiked with cinnamon, clove and vinegar, yielding a thick, rich and utterly exhilarating stew. Birria can be made with just about any red meat. While goat is the most classic meat for birria in Jalisco—from whence the dish originates—beef is also common. While goat may be a little bit challenging for the American palate, lamb is less so and is an excellent—and readily available—substitute with a similar flavor profile. 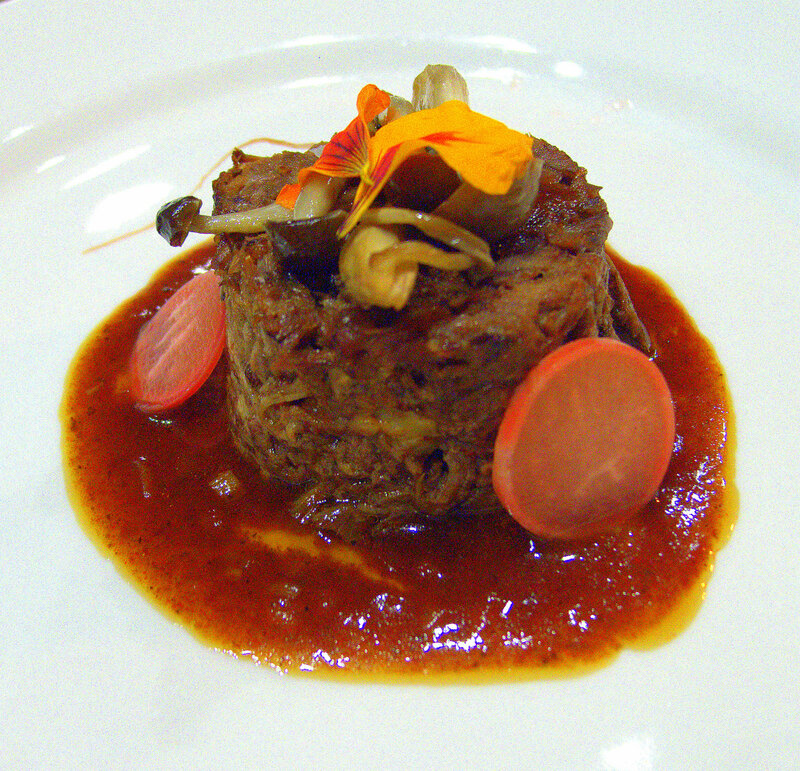 Birria is not, however, an upscale dish. That, of course, equates to opportunity. Classically served as a rustic stew, a more modern presentation—complete with modernist use of agar agar powder—brings the dish upscale. Pressing and cutting the birria meat into even geometrical portions offers many attractive opportunities. This recipe includes garnishes of roast garlic and fried cilantro as well as many other options. Play with them at your pleasure. Make the chile paste. Preheat a frying pan over medium heat. Cut the ends off the chiles, removing the seeds as you do so. Toast the chiles in the pan until they “brown” slightly, flip them and d toast the other side. Place the chilies in a deep bowl and cover with hot water. Soak the chilies for half an hour until they are tender. Remove the chiles20 to 30 minutes until they are tender. Remove the chilies from the soaking water and place in a Vitamix or other high speed blender with the vinegar and process to a smooth paste. Cook the “birria”. Add the onions, fennel and carrot to a large heavy pot, season them with Kosher salt and freshly ground pepper. Cover the pot and sweat the aromatics for five minutes. Meanwhile grind the remaining spices thoroughly. Season the lamb shanks with kosher salt and freshly ground pepper and add them to the pot. Strain the ground spices and sprinkle them over the shanks. Cover the shanks with water and turn the heat up to high. Bring the pot to a boil and immediately reduce the heat to a simmer. Simmer the shanks for three hours, until the meat is falling off the bone. Rest the “birria”: Remove the shanks from the pot and, when it is cool enough to handle, remove the meat from the bones, breaking it into smaller pieces. Meanwhile, dissolve the agar agar in ½ cup of the strained braising liquid and whisk to combine, bring to a boil and then lower the heat and reduce until the liquid has reduced by half. Place the meat in a bowl and pour the liquid over it, mixing to combine thoroughly. Place the meat mixture in a pate pan, casserole dish or other container, covering it with cling film. Put a plate (or another pate pan) over the meat mixture and weight it. Refrigerate overnight. Strain the braising liquid and refrigerate that too. Make the cilantro oil (if using). Blanch the cilantro stems in boiling water for 10 seconds. Shock in ice water and wring all water from the cilantro. Place the cilantro in the bowl of a food processor and add a dash of salt. With the processor running, add the oil in a slow and steady stream. Place the herb and oil mixture in a bowl and refrigerate until the rest of the dish is completed. Make the roast garlic puree. Preheat the oven to 300° Fahrenheit. Place the garlic cloves in an ovenproof container, cover with the extra virgin olive oil (the good stuff) and season with the Kosher salt. Cover the container with aluminum foil and roast for one hour, until the garlic is both soft and golden brown in color. Add the garlic cloves and ¼ cup of the oil to the bowl of a Vitamix or other high speed blender and process to a smooth texture. Add more oil if necessary. Put the garlic puree in a squeeze bottle or a ziplock bag, air removed one lower corner snipped to create a makeshift “pastry bag. Roast the brown beech mushrooms. Raise the temperature of the oven to 475° Fahrenheit and preheat a hotel pan (or baking sheet). Cut just enough off the base of the mushrooms to free and separate them from the base. Brush the mushrooms and place them in a metal bowl. Drizzle the oil over them and season them with the salt and pepper, tossing to coat. Turn the mushrooms out onto the preheated hotel pan, spreading them so they are not touching. Roast until they are golden brown, about 20 minutes. Make the birria reduction sauce. Combine the shallots and 2 cups of the birria braising liquid in a small sauce pan. Bring to a boil, lower heat to a simmer and reduce by half. Make the “Fried” cilantro. Trim the cilantro stems leaving the leaf with about ¼ inch of stem remaining (reserving the stems to make the optional cilantro oil). Cover a large plate with cling film and spray it with PAM canola oil or brush it with a very thin layer of grapeseed oil. Arrange the cilantro leaves on the wrapped plate (the precise strength setting will depend on the total maximum wattage of your microwave oven; for me it was 6) and fry the cilantro leaves for about 3-5 minutes, until they are just firm but have not yet begun to brown. Plate the dish. Pour a pool of sauce in the middle of a large plate. Place a pressed lamb piece on each pool of sauce. Arrange mushrooms on top of each piece of lang, topping each with a fried cilantro leaf (or edible flower). Make several attractive dollops of the roasted garlic oil around the plate. Garnish the meat with the pickled radishes (if using) and/or tortilla strips. Garnish around the plate with drops of cilantro oil (if using).